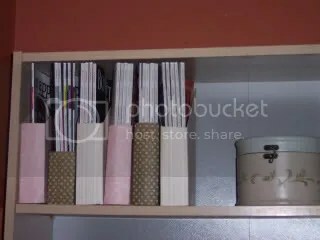 Form and function: Magazine holders made from cereal boxes | Me going green ... and dragging my family with me, kicking and screaming! I have a bit of a habit … it’s called Bon Appetit magazine. I have every issue from the last 3 years (which is when I first subscribed). Storage was becoming a problem though, and I consulted my friend, the organization WIZARD, to help me find a solution (you can find her under my blog roll: Modern-Simplicity). She linked me to an article on about.com or somewhere like that to make magazine holders out of cereal boxes and construction paper or gift wrap. I took it a step further and used scrap booking paper. So, just cut the top of the cereal box off to resemble commercial holders (sides slanted toward the front), then glue the paper to the box, lining the edge of the paper up with the bottom edge of the box (I do the front first, then the back that way the overlapped edge of the paper doesn’t catch when sliding the holder back into place), trim to leave about 1 inch at the top. Cut notches in the overhanging paper at the corners so that paper can be folded over to make a smooth seam at the top of the box. And that’s it! Hmm. I should take pictures of the steps the next time I make one … these instructions sound really confusing even though it’s totally not. They seriously take under 5 minutes each from start to finish. Beauty is clearly in the eye of the beholder, and you can see that I’m no perfectionist (but I DO want to redo that ONE, lol), so be as precise or as ‘eh, it’s good enough’ as you want. Either way, your magazines will look so much nicer on your shelf, and easier to organize to boot! AND, these are so easy to make that it’s no problem to whip another one up when you need it. If you find yourself enamored with a particular paper design, it may be a good idea stock up in case the pattern is discontinued by the time you want to make your next holder. The real beauty in this DIY project is that the savings are TREMENDOUS! I don’t know if you’ve ever priced these things, but they run from about $5 and up at retail establishments. The cost of this project is quite minimal. If you do not already have the glue, that’s the greatest cost. However, once you have it, it will last for many holders and can be used for lots of other projects too. A little tip for buying the glue is to get the Michael’s, AC Moore or Joanne’s ad from the Sunday paper. Typically there is a 40% off one regular priced item, and at least at Michael’s, the glue is rarely on sale, so a 4.99 item (about what the glue costs) becomes 2.99. SCORE! Also, scrapbooking paper frequently goes on sale at the same stores for 4 for $1. So, the bottom line is that if you have the glue, this project can cost as little as 50 cents! Even if you don’t have the glue already, the total project price is far cheaper than retail. It’s a win-win really. We do this, too!!! It’s so cheap and easy!! I love how you dressed them up, though. Never thought to do that! Got the link from CBBC’s decorating show-off thread and love this SO MUCH!! Thanks – we are so doing this….and I have about 4 boxes of cereal right now in the pantry. YAY!! Glad you like! They are so quick and easy to do. I have to start pimpin’ my blizz-og on the bhb more often, LOL! I’ve had 120 page views today alone! OMG! !